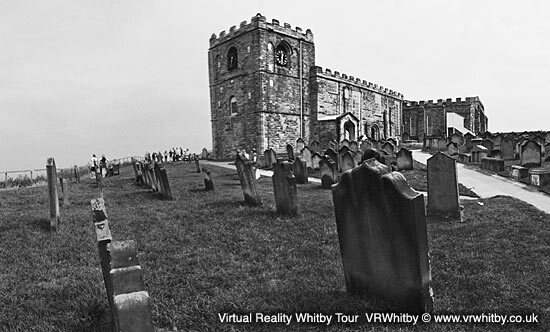 VRWhitby - Virtual Reality Whitby tour. 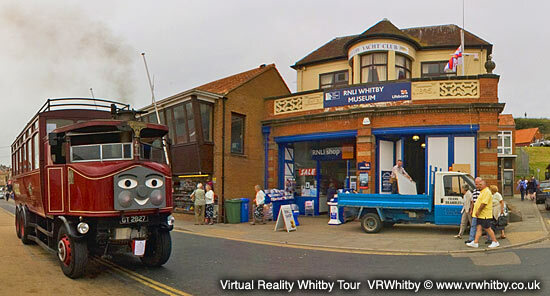 Whitby virtual tour guide to the North Yorkshire tourist destination. Whitby Abbey "Set high on a North Yorkshire clifftop, its remains overlook a picturesque town and harbour with associations ranging from Victorian jewellery and whaling to Count Dracula. .."
The Magpie Cafe, 14 Pier Road "Extremely popular with holiday-makers and locals alike, the food is always fresh and well cooked and the service friendly, quick and welcoming..."
Whitby West Pier "The £20-25m scheme could see rock armour used to shore up the piers and a possible new sea wall on the main west pier, with the possible use of a 'wave return wall' along the crest of the west pier as an alternative to rock armour..."
The Grand Turk "The Grand Turk was built in Marmaris, Turkey in 1996 for the price of £2 million. She is an authentic replica, based on historical drawings, of the frigate HMS Blandford built in 1741..."
If you are not sure where to go, what to see or do, then this site is the place for you. Basically, we've visited all the most popular spots, camera in hand and written our own reviews, so that you can make all those important decisions without leaving the comfort of your armchair. You can have a virtual tour of all the major sites, check out the weather or work out where everything is on our map. All you need to do is start clicking! Whitby is built around the fishing harbour and beach at the mouth of the River Esk, so you are always within reach of the sea. In fact, the whole history of the town is inextricably linked with the sea and fishing. For instance, the Whalebones, which remind us of Whitby's past, or the RNLI museum, the James Cook Statue or the impressive replica frigate, "The Grand Turk". Even the restaurants here have a link to the sea – such as the fabulous fish and chips at the Magpie. Of course, many people visit Whitby for the beach at West cliff and the piers (West Pier, Tate Hill Pier) and the Marina. The town is dominated by St Hilda's Abbey on the far side of the river, which is a bit of a climb (199 steps...) but well worth the effort for many visitors! And the shops themselves are a treat – try Arguments Yard, Sandgate and Church Street for individual shops and a chance to buy jewellery made from Whitby jet, or the unusual attraction of the Dracula Experience on Marine Parade.